The 14 survivors spent 56 hours in the rubber boat before being picked up by the U.S.S. OMAHA. As the boat was far too small to accommodate 14 men, all sat with their legs in the water. Leutnant Brodt, as the senior officer, took command, and ordered sail set for the Brazilian coast. During the first night, a freighter of some 5000 tons passed within 800 meters of the survivors, but all efforts to attract the ship's attention failed. 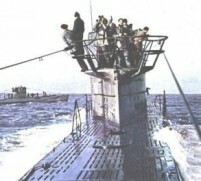 A number of patrol planes were sighted as well as several destroyers and planes which were believed to be the elements of an anti-submarine task group. Brodt was stated to have been unable to control his fury at Roch, who was considered responsible, as the lookout from whose sector the bomber had attacked, for the loss of the U-boat. Had the group remained intact much longer, survivors maintained that Brodt would have provoked a mutiny by his conduct and been killed by the men. With the assumption of command, Brodt became an insufferable martinet. The rations dropped by the relief plane were more than adequate, and there was no particular discomfort except that occasioned by overcrowding of the boat. Late on the second day after the sinking, a corvette approached but turned away; then the U.S.S. OMAHA hove into sight, put over a boat and brought the survivors aboard.